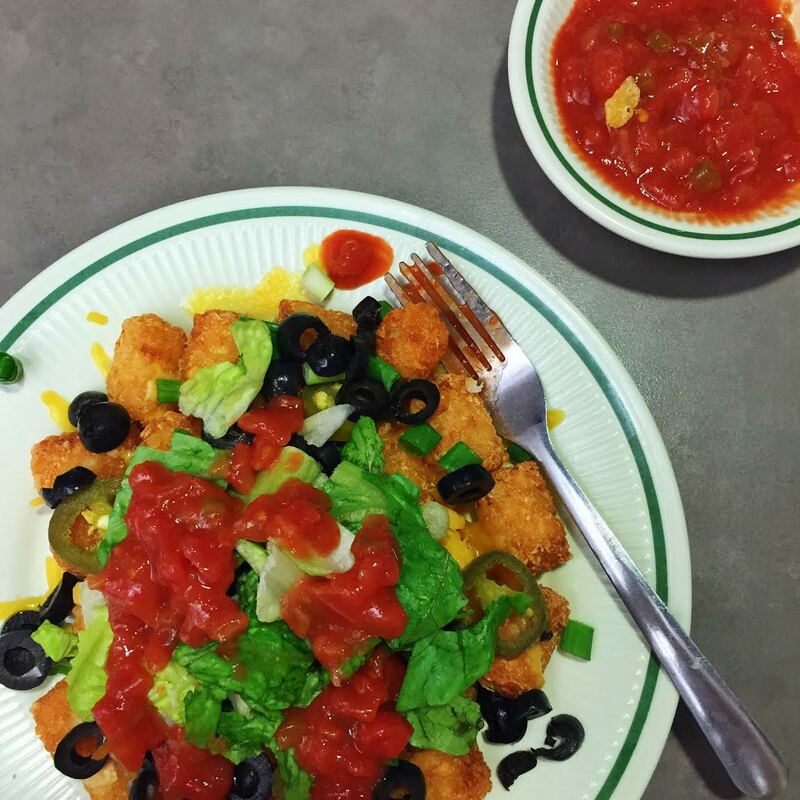 Nacho average tater tots, huh? And they were so insanely good that I thought I’d share some of my favorite dining hall ‘recipes’ with you. Breakfast Nachos: Breakfast Potatoes Cheese (cheddar/pepper jack preferably) Olives, Black Beans, and Shredded Lettuce (these are usually at the salad bar) Jalapeños & Salsa (these are at the omelette station) Make your way over to the microwave (if your cafeteria has one) and melt the cheese over the potatoes for about 45 seconds. Layer the other ingredients on top, adding/omitting whatever you feel. Enjoy! Breakfast Bowl: Grits (which our cafeteria always has #thesouth) Cheddar cheese Scallions Fried Egg (we have an egg/omelette station where you can get eggs any way) Pour the cheese and scallions over the grits, then get a fried to put on top. Toss on some crumbled bacon if you want to get really fancy, or maybe add some hot sauce. Enjoy! Greek Wrap: Tortilla (which I get from the sandwich bar) Hummus, Red Onions, Olives, Peppers, Lettuce (which I get from the salad station) Feta (which I get from the egg station) Oil/Vinegar Put all the ingredients in the wrap, drizzle with some oil and vinegar, wrap and enjoy! Waffle Sandwich: Literally put ANY sandwich ingredients between two waffles instead of bread. BAM. Open-Faced Breakfast Biscuit (the best weekend breakfast): Biscuit (again, southern school) 2 slices tomato 2 slices cheese 2 fried eggs Whatever breakfast meat you may want Oil, salt, pepper Split your biscuit into halves and drizzle with a little olive oil. Stack the cheese, tomato, and breakfast meat on. Get your two fried eggs and have them put on top of your sandwich instead of on the plate. Dole Whip (which I know you’ve had if you’ve ever been to Disneyland. SO. GOOD. ): Pineapple Pineapple Juice Vanilla Soft Serve Get some pineapple and cut it into tiny pieces. Get a bowl with high sides or a cup and fill with as much vanilla soft serve as you want. Pour the pineapple juice over the soft serve and top with pineapple pieces. **You can also do this with other fruits/fruit juices/sodas and make it into a float. 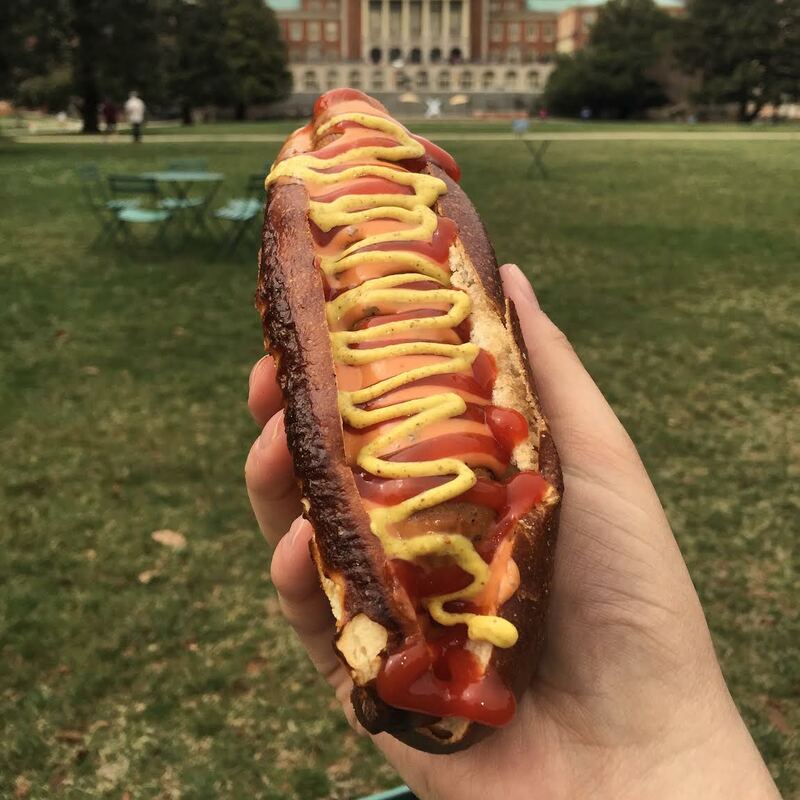 Do you have any favorite dining hall hacks to upgrade your typical college meal? Let us know in the comments! **Update: We did clear the ant infestation but seeing that reminded me and now I'm being paranoid about bugs.